Inside each of us is an instinctual being filled with primordial wisdom. This older than old knowing, like the serpent, is often feared or even despised. Yet, without our primal instinct we become automatic, fearful, imprisoned and bored. Le’ema Kathleen Graham, ordained priestess, urban shaman, and visionary sacred dancer, shows us how our instinct can be renewed through shedding our old skins. With stories from her life, goddess archetypes, sacred dances, shamanic journeys, dreams and visions, Le’ema helps us reconnect to the thriving intuitive intelligence that pulses within our very own essential nature. Dancing the Inner Serpent: Memoirs of a Suburban Snake Priestess is a pilgrimage filled with joy, losses, love and awakenings. 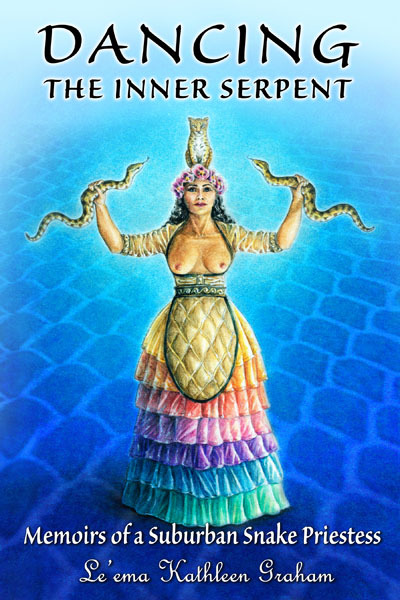 Through her devotion to the Divine Mother, first as a Catholic girl, and later to the Goddess, Le’ema’s dancing path as a Snake Priestess unfolds.